Wash and dry the strawberries, cut off the tops, and cut in half or quarters if they’re big in size. 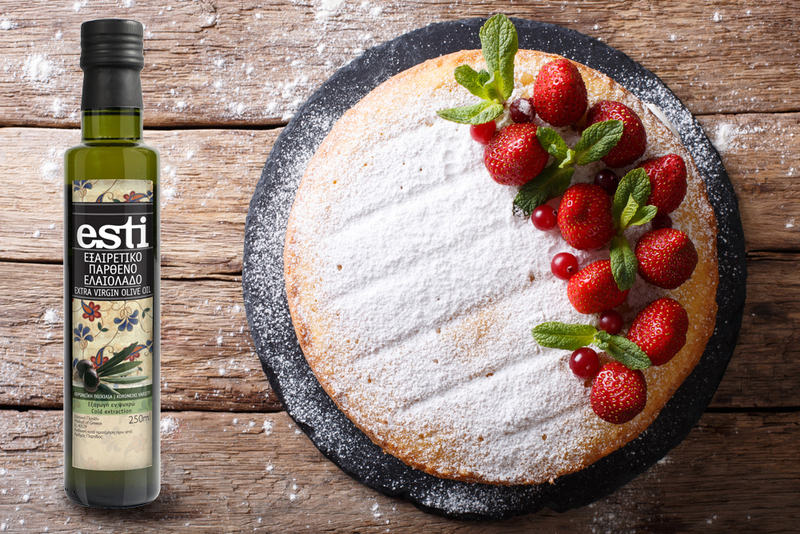 Cover the inside of a 20 cm cake pan with some esti extra virgin olive oil. In another bowl whisk together the sugar, olive oil, milk, vanilla extract, lemon zest, and lemon juice. Mix until well combined, and then add in the eggs one by one. Whisk until smooth, and then add in the flour mixture. Whisk until the batter is light and fluffy. Pour into your prepared cake pan. Starting from the center of the cake, lay down the strawberry halves (or quarters) close together, and work your way out until the whole cake is covered. Bake the cake for about 50 minutes or until a toothpick inserted in the center comes out clean. If the surface gets dark rather quickly, covers the cake with aluminum foil- so do check in the first ½ hour how it goes. Let cool for at least ½ hour before removing from the pan.